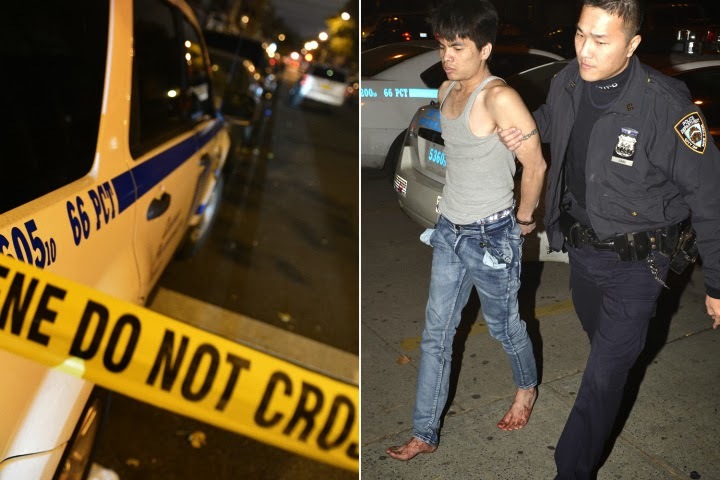 A mother and her four children were brutally murdered late Saturday evening morning, after a man turned a Sunset Park, Brooklyn home into a “slaughterhouse“, stabbing a woman and her children, all ended up dying. The suspect is a 25 year-old man reported to be a cousin who has been arrested and in the photo below can be seen handcuffed and taken into custody, his feet still bloody from his killing spree. Police identified the victims as 1-year-old William Zhuo, a 5-year-old Kevin Zhuo, a 7-year-old Amy Zhuo, 9-year-old Linda Zhuo and 37-year-old Qiao Zhen Li. “He [the suspect] was bizarrely calm,” said one neighbor, who asked that his name not be used. “He was completely composed and answering their questions – even as they brought out two black bags with the kids in them,” the neighbor said.